Venkaiah Naidu holds the numerical advantage over Gopalkrishna Gandhi when members of Parliament vote in vice-presidential elections. The name of the next vice-president of India will be officially announced in the evening. 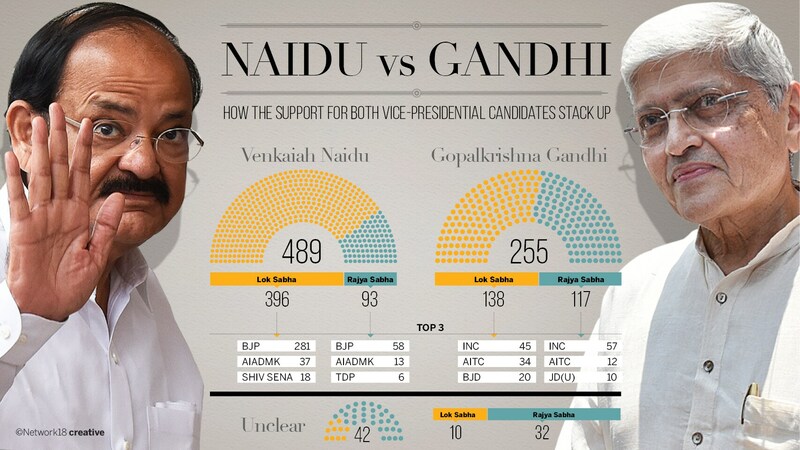 New Delhi: NDA candidate M Venkaiah Naidu holds the numerical advantage over Opposition nominee Gopalkrishna Gandhi in vice-presidential election on Saturday. The name of the next vice-president of India will be known by evening after members of Parliament cast their ballot during the day in Parliament House. The ruling NDA, which has a majority in the Lok Sabha, will find it easy to place its candidate as the next vice-president. However, the BJD and the JD(U) which had supported NDA nominee Ram Nath Kovind for the post of President, have decided to back Opposition nominee Gandhi. Though the JD(U) has broken ties with the Mahagathbandhan and joined hands with the BJP to form a new government in Bihar, it has decided to vote for Gandhi, a former governor of West Bengal. Members of Parliament will use special pens to mark their choice in the election to be held between 10 am and 5 pm. The counting of votes will commence after polling and the results will be declared by 7 pm, Election Commission officials said. The term of incumbent Hamid Ansari, who has held the post for two consecutive terms, is coming to an end on August 10. The Electoral College which elects the vice-president, who is also the ex-officio Chairman of the Rajya Sabha, consists of elected and nominated members of the Rajya Sabha and the Lok Sabha. The total strength of the two Houses is 790, but there are two vacancies in the Lok Sabha and one in the Rajya Sabha. BJP MP in Lok Sabha Chhedi Paswan is barred from voting following a judicial pronouncement.